Cakes are one of the coolest food you can eat. It can be consumed to regenerate hit points at 1 point per bite (up to 6 max). What makes it more interesting is that you will need to place it onto a block before eating it. Below is a tutorial on how to make a cake in Minecraft. The only way of obtaining cake besides crafting would be through trading with villagers. You can trade 1 for 1 with Emeralds. The easiest way to get a cake is by Collecting the necessary recipe ingredients. The player will first need to start off by making a Crafting Table. Each player starts off with a 2×2 crafting grid located in their inventory however this recipe is much more complicated and requires a 3×3 grid. This is done by opening your inventory box (Pressing ‘E’) and placing 4 Wooden Planks into the 2×2 grid located in the top right corner. You are able to use any type of Wooden Planks like oak, spruce, birch, jungle, acacia, or dark oak. In the example below we are using oak wooden planks. Once you are done with this step you should see a crafting table appear to the right of the arrow. Right clicking on the item will put your new crafting table into your inventory. After you have completed the recipe you will need to equip the table to your hand. This is done by dragging the item to the bottom left row of your inventory box. The last step is to place the item on the ground. To do this you will need to find an open area you will like the table placed at then right click to put it on the ground. Doing this will allow you to then click on the crafting table and utilize a 3×3 grid for crafting recipes rather than the default 2×2 from your inventory. 3 Bucket of Milk – These are made by taking a bucket and rigtht clicking on a Cow or Mooshroom. Having the Bucket in hand will fill it with Milk. Further information can be found on How to Make a Bucket in Minecraft. 3 Wheat – Placing Wheat Seeds onto soil will grow the soil into a wheat block. These can then be harvested for wheat. 1 Egg – These are dropped by Chickens in the Overworld. 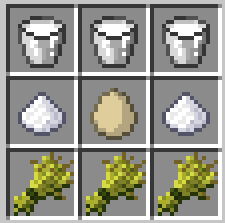 2 Sugar – can be obtained by finding Sugar Cane in the Overworld. Each fully grown Sugar Cane will drop 3 pieces of Sugar Cane that can be crafted into Sugar. This is the hardest ingredient for making Cake if you do not make your own farm. Tip: The Minecraft crafting recipe for a Cake is made of ingredients typically hard to find in the game. You can however create your own farm to make these. You will need to put the 3 wheat lined across the bottom row and 3 buckets of milk in the top row. The middle row will need to have the sugar on both the right and left side while the egg is directly in the middle. Once this is done you will see the item appear in the empty box to the right. Right click on this to transfer the item into your inventory. Now that you have learned How to Make a Cake in Minecraft, in order to be able to eat the Cake, place it on top of a block. 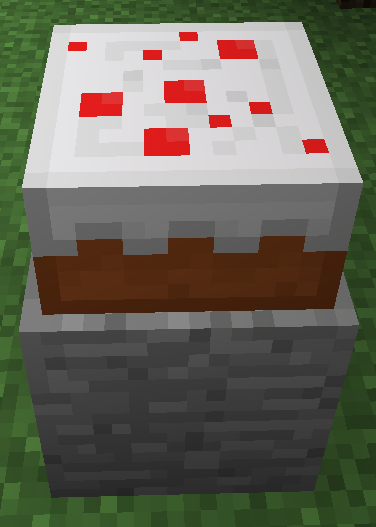 Unlike most other food items in Minecraft, you are unable to eat Cake directly from your inventory. Each part of the Cake restores 1 hunger, allowing a max of 6 hunger to be restored from one. Cakes are not stack-able in your inventory and are not able to be moved when placed on the ground. It is unable to be picked up again because it is a transparent block.